SEATTLE — Attorney General Bob Ferguson today announced that Facebook signed a legally binding agreement with his office to make significant changes to its advertising platform by removing the ability of third-party advertisers to exclude ethnic and religious minorities, immigrants, LGBTQ individuals and other protected groups from seeing their ads. The agreement requires Facebook to make these changes within 90 days. The impacts will be nationwide. This agreement is legally binding in Washington state. Facebook will change its platform nationwide. This action concludes a 20-month investigation by the Washington State Attorney General’s Office that began after nonprofit ProPublica published an article on Facebook’s advertisement targeting. The assurance of discontinuance, filed in King County Superior Court, resolves the Attorney General’s investigation into whether targeting options for advertisements on Facebook’s platforms constituted unfair acts and practices, a violation of the state Consumer Protection Act and the Washington Law Against Discrimination. On Oct. 28, 2016, nonprofit ProPublica published an article titled “Facebook Lets Advertisers Exclude Users by Race.” Finding the allegations in the article alarming, the Attorney General’s Office launched an investigation in November 2016. The office discovered that the social network service’s platform allowed advertisers to exclude African-American, Latinx and other ethnic affinities from seeing ads. 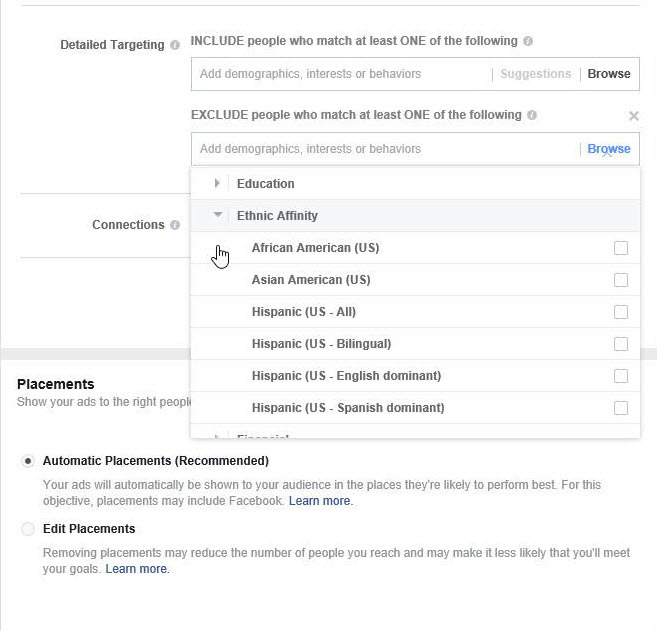 Facebook did not offer exclusion options for Caucasians. Investigators in the Attorney General’s Office successfully used the platform to create 20 fake ads that excluded one or more ethnic minorities from receiving their advertising for nightclubs, restaurants, lending, insurance, employment and apartment rentals. This meant that these ethnic groups would not be able to see the ads at all, and would therefore be unaware of the opportunities in the advertisements. For example, AGO investigators posed as a restaurant. The restaurant ad excluded African-American, Asian-American and Latinx ethnic affinity groups. Despite discriminatory exclusions and language, Facebook’s advertising platform approved all 20 ads. Following this report, Facebook faced mounting pressure from civil rights advocates, the Congressional Black and Hispanic Caucuses and Ferguson’s investigation. On Nov. 29, 2017, Facebook announced that it was “temporarily” removing all exclusion options for ethnic affiliations. Throughout these reports, Ferguson’s office continued to investigate Facebook’s targeting options because changes made to its advertising platform were only temporary and limited in scope. Investigators for the Attorney General’s Office discovered that advertisers could still exclude people based on several other protected classes, such as sexual orientation, religious affiliation and veteran status. Investigators also found that the problem extended beyond advertisements for housing, employment and credit to those for public accommodations and insurance. In concluding his investigation, Attorney General Ferguson required fixes far broader than the temporary changes Facebook announced in November 2017. These changes will be permanent and legally binding. The assurance of discontinuance requires Facebook to remove these exclusion options for any advertiser whose ad Washingtonians may have the ability to see. According to Facebook, these changes to its platform will be nationwide. 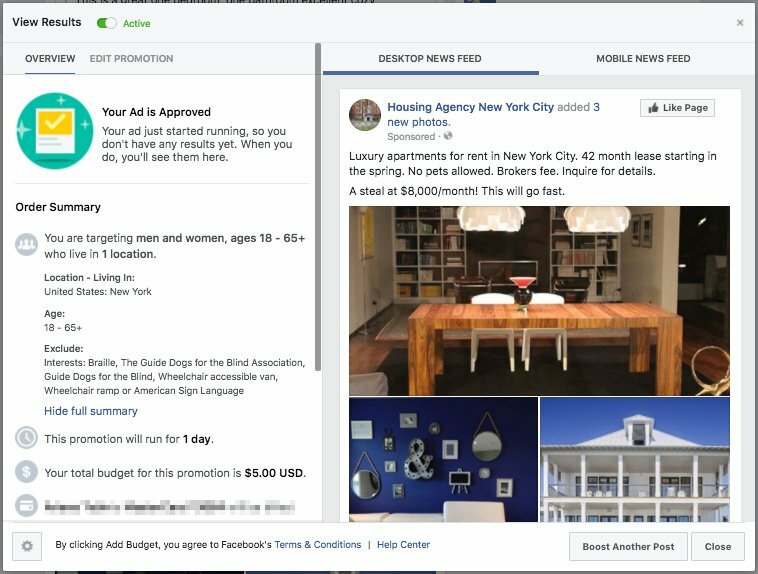 According to the assurance of discontinuance, Facebook will fix its advertising platform to remove the unlawful targeting options within 90 days. The social network service also will pay the Washington State Attorney General’s Office $90,000 in costs and fees. Assistant Attorney General Marsha Chien of the office’s Wing Luke Civil Rights Unit and Assistant Attorney General Dan Davies of the office’s Consumer Protection Unit handled the case for Washington. The Wing Luke Civil Rights Unit works to protect the rights of all Washington residents by enforcing state and federal anti-discrimination laws. It is named for Wing Luke, who served as an Assistant Attorney General for the state of Washington in the late 1950s and early 1960s. He went on to become the first person of color elected to the Seattle City Council and the first Asian-American elected to public office in the Pacific Northwest. If you are a Washington consumer having an issue with a business, you can file a complaint with the Attorney General’s Office.